Dr. Kent Weigel and Dr. Penny Riggs in Washington DC for their presentation at the nation’s Capitol. October 24, 2016 – American Society of Animal Science (ASAS) hosted a Snack & Fact today in Washington, D.C. Nearly 40 attendees joined us for a presentation on “Food Animal Production in the Genomics Era.” The briefing was held over the lunch hour in the House Agriculture Committee room, 1300 Longworth House Office Building, Washington D.C. The hour-long briefing included a light lunch and presentations by Dr. Kent Weigel and Dr. Penny Riggs served as guest speakers for the genomics Snack & Fact briefing. Dr. Riggs gave a “Brief Overview of Genomics and Its Impact on Society.” Dr. Weigel discussed “Successful Application of Genomics Advances for Dairy Cattle.” A recording of the briefing will be available soon on the ASAS website. The day also included visits with the legislative assistants for Rep. Bill Flores (TX-17) and Rep. Mark Pocan (WI-2). 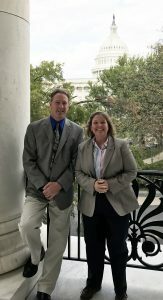 The goal of the ASAS Snack & Fact briefings is to share information about topics affecting animal agriculture and to serve as a resource for attendees, including congressional staffers and key stakeholders. For the program brochure, click here.